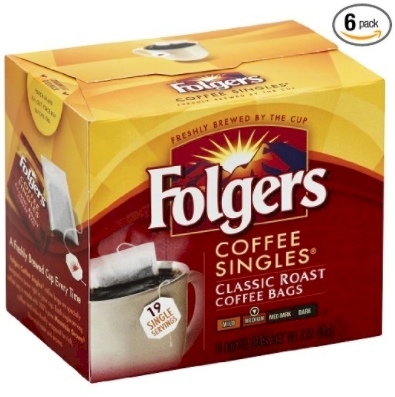 Amazon has got this 6-box count Folgers Coffee Singles for as low as $16.79 or $2.80 per box of 19 bags. This price is roughly half of what these cost in stores like Walmart or Target. Just to clarify, these don't work with a Keurig or any type of coffee maker. They are coffee bags (like tea bags) that basically make fresh coffee in a cup of hot water. We use them on Shabbos and for traveling, because neither my husband nor I can choke down any form of instant powdered coffee. (BTW, halachically speaking, ask your Rav about using these on Shabbos because not everyone holds that you can use these.) These make delicious coffee and I sometimes use them during the week when I don't want to bother with a Keurig or coffee machine.